Johnny Carr and Habul Mukherjee were in charge of the final camp in Mumbai, after which a team of 20 players was chosen for the London Olympics. Right-winger Kishan Lal of Railways was named captain. The vice-captain was K. D. Singh 'Babu', a flamboyant player as mercurial as his flashy game. There were as many as 7 players from Mumbai. There were 4 centre-forwards in the team - Reggie Rodrigues, Glacken, Balbir Singh Sr. and Shakur. The team left for London two weeks before the Olympics. On the tarmac, Sir John Bennett, a member of the Olympic Reception Committee, received the Indian team with warmth. He had worked for Punjab Police till just an year before, in pre-Independent India. 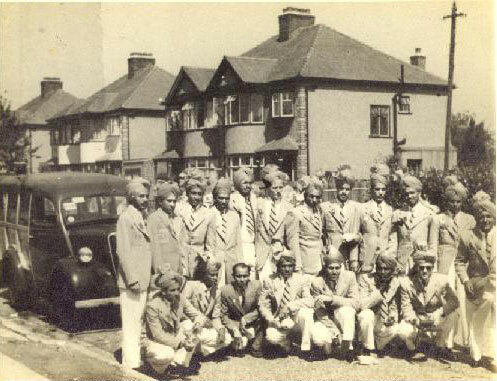 The photograph below shows the Indian hockey team in full dress before leaving for the Opening Ceremony.